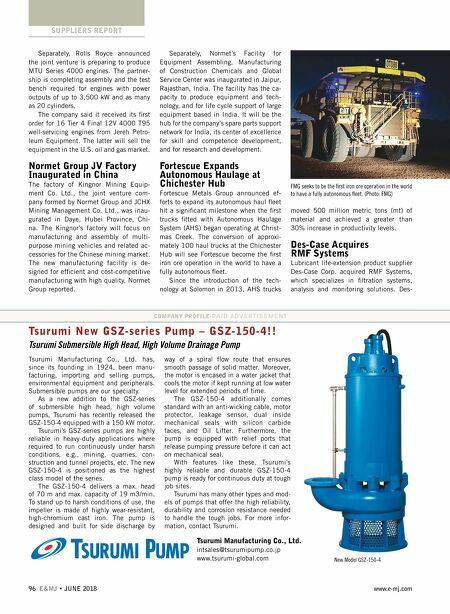 JUNE 2018 • E&MJ 97 www.e-mj.com SUPPLIERS REPORT Case historically served the North Amer- ican breather market, while RMF served the European filtration market. The com- bined product line reportedly will provide solutions of superior breadth and depth for any contamination problem. 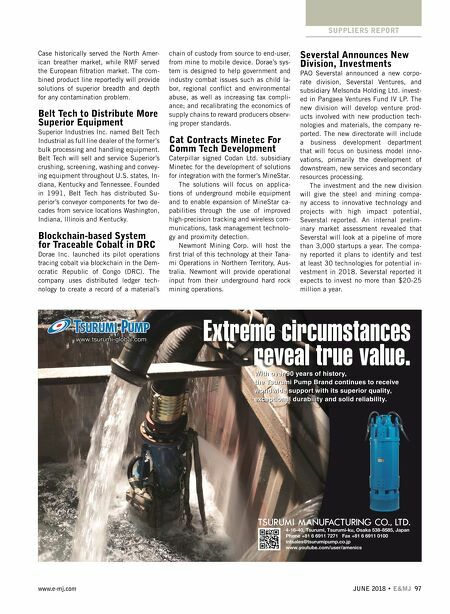 Belt Tech to Distribute More Superior Equipment Superior Industries Inc. named Belt Tech Industrial as full line dealer of the former's bulk processing and handling equipment. Belt Tech will sell and service Superior's crushing, screening, washing and convey- ing equipment throughout U.S. states, In- diana, Kentucky and Tennessee. Founded in 1991, Belt Tech has distributed Su- perior's conveyor components for two de- cades from service locations Washington, Indiana, Illinois and Kentucky. Blockchain-based System for Traceable Cobalt in DRC Dorae Inc. launched its pilot operations tracing cobalt via blockchain in the Dem- ocratic Republic of Congo (DRC). The company uses distributed ledger tech - nology to create a record of a material's chain of custody from source to end-user, from mine to mobile device. Dorae's sys- tem is designed to help government and industry combat issues such as child la- bor, regional conflict and environmental abuse, as well as increasing tax compli- ance; and recalibrating the economics of supply chains to reward producers observ- ing proper standards. Cat Contracts Minetec For Comm Tech Development Caterpillar signed Codan Ltd. subsidiary Minetec for the development of solutions for integration with the former's MineStar. The solutions will focus on applica- tions of underground mobile equipment and to enable expansion of MineStar ca- pabilities through the use of improved high-precision tracking and wireless com- munications, task management technolo- gy and proximity detection. Newmont Mining Corp. will host the first trial of this technology at their Tana- mi Operations in Northern Territory, Aus- tralia. Newmont will provide operational input from their underground hard rock mining operations. Severstal Announces New Division, Investments PAO Severstal announced a new corpo- rate division, Severstal Ventures, and subsidiary Melsonda Holding Ltd. invest- ed in Pangaea Ventures Fund IV LP. The new division will develop venture prod- ucts involved with new production tech- nologies and materials, the company re- ported. The new directorate will include a business development department that will focus on business model inno- vations, primarily the development of downstream, new services and secondary resources processing. The investment and the new division will give the steel and mining compa- ny access to innovative technology and projects with high impact potential, Severstal reported. An internal prelim- inary market assessment revealed that Severstal will look at a pipeline of more than 3,000 startups a year. The compa- ny reported it plans to identify and test at least 30 technologies for potential in- vestment in 2018. Severstal reported it expects to invest no more than $20-25 million a year.